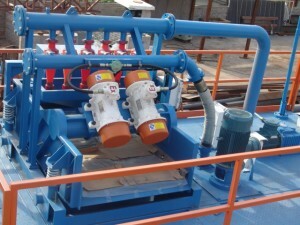 GN oilfield drilling mud Desilter is discussed for application in mining slurry separtion. Thank you for your e-mail of 12th October about your solids control equipments application. We are of opinion that, during your interpretation of the technical specifications and the screen analysis of our ore, a misunderstanding must have occurred. The result of the screen analysis of our ore we sent to you was only to give you a general information about the grain size of the ore. These grain sizes do not reflect the particle sizes which we will feed into our process line. The ore we are going to feed into the concentrator will preliminarily be screened through a 0,500 mm (35 mesh U.S) screen and be reduced down to -0,500 mm. Following this, -0,500 mm material will be deslimed by separating ≥15µ using Hydrocyclone desilter and in this way we will end up with a material of -500 mm + 0,015 mm. Studying the technical parameters of your ZQJ DESILTER, we understood that we can deslimed our (-0,500mm) material, by separating it at ≥ 15µ, using your ZQJ DESILTER. During this operation we think that the solid rate of the pulp should be approximately 15%. We are waiting for your answer, stating, if it would be possible to apply the process given above successfully using your DESILTER. We can discuss and negotiate the details about your other equipment like shale shakers,decanting centrifuges, machinery and pump after having finished the negotiations about the applicability of DESILTER.